If Nelson Peltz's plan for DuPont is implemented, the company – which already has announced the spinoff of Chemours – will be leaner at the top and possibly split into two more separate units. Peltz has unveiled ideas for a new DuPont through various white papers, regulatory filings and interviews. He has proposed reducing its holding company structure and tying unit manager's performance more closely to the company's goals; eliminating between $2 billion and $4 billion of excess waste; increasing DuPont's debt burden, and possibly breaking it into two spinoff companies. Supporters of the Peltz plan say it will create a leaner, more profitable company. DuPont counters that it has already cut waste and rewarded shareholders with a 160 percent return over the last five years, exceeding its peers and the Standard & Poor's 500. The Peltz plan could further alter the company, which has undergone a series of major changes recently, including announcing it will spin off its performance chemicals unit, Chemours, later this year and moving out of downtown Wilmington after 107 years in the same location. "DuPont has been doing the same things for many years," said April Klein, an accounting professor at New York University's Stern School of Business. "There has to be feeling that the company is resting on its laurels and maybe it's time to shake things up. It's not clear where DuPont's growth opportunities are anymore and its not illogical for someone to come and try to shake up how the company is being run." Led by Peltz, Trian Fund Management has a roughly $1.9 billion stake in DuPont. The New York hedge fund has initiated a proxy war to place four candidates, including Peltz, on the company's board. If elected, Trian board members would lobby DuPont to shed what it has characterized as corporate waste and inefficiencies. In a September letter to DuPont's board, Peltz advocated separating the company's seven business units. Under the plan, the agriculture, nutrition and health and industrial biosciences, also known as DuPont's high-growth businesses units, would be split into one company. The remaining units, comprised of DuPont's cyclical, high-cash generating businesses, performance materials, safety and protection and electronics and communications, would become another single company. If the split occurs, what was once DuPont would then be three independent units, including Chemours. In recent weeks, though, Trian representatives have backed away from the idea of splitting the company. In February, Peltz said he was "open minded" about keeping DuPont together. Ed Garden, chief investment officer at Trian, said in an interview Friday with The News Journal that the hedge fund's main goal is to reduce DuPont's holding company structure. "We are agnostic about splitting the company," he said. "We put forth the idea of splitting up the company because we see a situation where the company can't hit its growth targets." Some, including DuPont, have argued its conglomerate structure has driven innovation because different units share research and development ideas. The company launched 1,600 new products and filed more than 1,650 U.S. patents in 2014, according to regulatory filings. "While DuPont's board and management team have been executing a plan to deliver value, Trian has been repeatedly demanding that DuPont break itself up and add excessive debt, or face a proxy fight," the company said in a released statement. "DuPont's board and management team, with the assistance of independent advisers and leading third-party consultants, thoroughly analyzed each of Trian's proposals and concluded that they are high risk and would destroy shareholder value." "The positions of Peltz and DuPont are the classic set of arguments for and against these holding companies," said Emilie Feldman, an assistant professor of corporate strategies at the Wharton School of the University of Pennsylvania. Garden said Trian's plan is to create a more efficient DuPont by scaling down its holding company structure. Under the chemical giant's corporate structure, the main DuPont entity acts as a holding company for its seven business segments as well as other ventures such as the Hotel DuPont and DuPont country club. He said the hedge fund is not seeking to divest DuPont's individual segments, but rather make each unit's managerial team more responsible for daily operations such as research and development. "Splitting up the company is not the only way to create value," he said. "We would suggest pushing more responsibilities down to the operating units and making the holding company very lean. The holding company would only do things the units can't do, like make public company Securities and Exchange Commission filings." Yet Garden does concede that a split is a possibility. "A separation is a means to an end," he said. "It is one way for DuPont to create value and improve operations. This could be a catalyst to eliminating the excess costs in the holding company. By separating, we see a higher probability that the businesses that make up DuPont become best in class." Joe Cornell, founder of Spinoff Research, said it would be very difficult for DuPont to shrink the holding company while keeping seven diverse business units intact. "It is possible," he said. "But I believe it will be difficult to streamline the various units when they are under the same roof. In my mind, if there are not real synergies, what is the point of keeping everything combined?" Feldman, of Wharton, agreed Trian could reduce DuPont's conglomerate costs without touching individual business units, but said it does not resolve Peltz's original claim that DuPont is operating seven distinct business sectors. "Peltz and Trian have argued the seven businesses don't belong in the same company," she said. "The only way to resolve that is some form of divestiture." One analyst, Jonathan Morgan of The Edge Consulting Group, a London spinoff advisory firm, said Peltz should split DuPont even further by divesting the company's safety and protection units from the cyclical, high cash company. The safety and products division generated $3.8 billion in revenue last year, according to DuPont's 2014 annual report. "Safety and products has a better growth perspective if it is treated as a separate company," he said. "It can flourish as a separate entity. We expect to rate it similar to its peers such as 3M." The high growth company could even go on offense and become an acquirer itself, according to Morgan. FMC Corp, a Philadelphia agriculture and industrial company, would be a natural acquisition target for the high-growth businesses, according to Morgan. The company would share common business segments with DuPont's possible high-growth entity, including agriculture and nutrition and health. Some of FMC's nutrition and health products are manufactured in Newark. Although FMC has not announced that it is putting itself up for sale, Morgan said the combination of FMC and the potential high-growth unit could create national synergies across similar units. He added that it would help DuPont's high-growth businesses to sustain itself against increased competition after a possible spinoff. "Splitting up DuPont is a good stepping stone, but it is halfway there in our eyes," Morgan said. If Peltz moves forward with the plan to separate DuPont, the three new entities, including Chemours, would be significantly smaller than the current company. The high-growth businesses combined for a total net revenue of roughly $16 billion last year, according to DuPont's annual report. Meanwhile, the cyclical or high-cash units generated a total of $12.3 billion in net revenue last year. When combined with DuPont's other revenue-generating businesses, including performance chemicals, the company produced $34.7 billion in revenue. Chemours produced roughly $6.5 billion of net revenue, according to DuPont's regulatory filings. Despite the smaller size, analysts say the spinoffs would be sustainable. Most spinoffs have successful track records, according to the Edge's research. Of the 610 spinoffs that have occurred over the last 15 years, 60 percent generated shareholder value within the first two years. Spinoffs have historically outperformed thier parent company in a majority of cases. A J.P Morgan study of 77 spin-offs between 1985 and 1995 revealed that spin-offs outperform the stock market by an average of 20 percent during the first 18 months after the transaction. The same study also found that the parent companies can outperform the stock market by as much as 6 percent in the time between the spinoff's announcement and the actual divestiture. One key reason for the success of spinoffs is a leaner company allows management to focus on core industries without the distraction of trying to support struggling units. "I think spinoff management gets their entrepreneural juices revved up," Cornell said. "If you are the low man on a conglomerate's totem pole, you are now calling the shots in a spinoff. You can bring out new products and do things to better grow the business." Garden said DuPont's unit managers could still call the shots in a leaner, less bureaucratic structure. "We believe the way to get business prospering is to allow the employees who are running the segments to control their own destiny, like their R&D," he said. "We believe you need accountability and focus by those that are closest to the businesses." The conglomerate structure also has its advantages. Underperforming units can continue to survive until they are profitable by receiving reallocated funds from a more successful segment. A bad period in one market is not as devastating to the holding company as it would be in a leaner operation. General Electric, for example, was one of the most successfully diversified companies in the world under the leadership of former Chairman and Chief Executive Officer Jack Welch. It remains successful with holdings in oil and gas, finance, aviation and healthcare. Academics have debated the issue of the conglomerate structure as opposed to smaller, independent businesses for years, according to Feldman. She said no data or research has ever conclusively laebled one side as the victor. E. Han Kim, a finance professor at the University of Michigan, said the sharing of financial resources among individual units in a conglomerate structure has ensured individual success for fledgling segments. "Research and development is expensive," he said. "A conglomerate can create synergies between its cash rich divisions and growth sectors, which require more investment. In a spinoff, a manager cannot spread liability across multiple units." Peltz has identified the hotel, country club and theater among excess expenses, but has not detailed other examples. Financial information for the hotel and the country club are not publicly available and DuPont has declined to release the information. DuPont has already agreed to sell the theater to The Grand Opera House in a transaction expected to be completed later this year. "The world is a very competitive place and every dollar counts," Garden said. "We believe DuPont needs to stop spending money on bureaucracy and instead spend money wisely on things like research and development and safety." The chemical giant has countered in regulatory filings that it has already reduced expenses. DuPont has cut costs by more than $2 billion since 2008, according to those filings. It achieved this goal by by consolidating 23 separate businesses into 12 entities, reduced management by 32 percent and standardizing its automated transaction process. DuPont also said in the filings that it is committed to reducing costs by at least $1.3 billion by 2017 and will continue to look for additional savings. "Overall, our efforts will enhance our efficiency and effectiveness, driving greater performance on a smaller cost base," the filing reads. Kim said parties in a proxy contest can always debate the definition of corporate waste. Corporate jets, for example, may be an inefficient use of company resources, but they also improve executive efficiency by reducing travel time. "Corporate waste is always in the eye of the beholder," he said. Peltz also called upon Dupont to increase its debt-to-equity ratio, arguing a modest amount of debt could help the company improve its earnings-per-share target. Monsanto, a DuPont competitor, announced last year that it will increase its debt load, creating an equity-to-debt ration of 1.5 to 1. The move represented a significant departure from how Monsanto operated in the past. DuPont has challenged Peltz's claim, alleging the increased debt load would limit the company's ability to operate and could impact future growth by having to reduce its debt load in the future. Morgan said that a slightly higher debt load would not impact DuPont's efforts to spin off companies, if it chooses to go that route. "Our feeling at this stage is that even if this did create further debt on Dupont's balance sheet, we don't think that the debt amount would be so significant that it would create problem for the new spun off entities," he said. Whether DuPont opts to enact any of Peltz's ideas depends on multiple factors. First, it would depend on the chemical giant's shareholders electing any or all of the four Trian nominees to the board. Even if all four join DuPont's board, they would still only make up a third of the directors and could not act unilaterally. Any plan would likely be negotiated between the Trian directors and DuPont's remaining board members, meaning it is unclear what the final outcome would be. Morgan said even if all four Trian members join the board, the negotiating of any plan could take a while. "I see this fight spilling over into 2016," he said. "Whether it is even resolved that year depends on what means and measures Peltz is able to put into place." Corporate spinoffs have been on the boil for a few years now and the strong short and long-term positive returns for spun off companies continue to back up the rationale for them. (See table.) In the first quarter, the Bloomberg Spin Index, which holds spun-off companies over $1 billion in market cap for three years from their separation, was up 6.8%. The Guggenheim Spin-Off exchange-traded fund (CSD) rose 6%. The further back you go, the better the outperformance gets versus the market. Spinoffs are typically done when one or more of a company’s disparate divisions don’t fit with the others, and the combined market value doesn’t fully reflect the value of the various businesses. Shareholders get separate shares of the new company, often a pure-play stock. A recent example is Kraft Foods Group (KRFT), which soared 45% last month on news of its planned merger with H.J. Heinz. In October 2012, Kraft Foods, a North American groceries company, was spun off from the old Kraft, which changed its name to Mondelez International (MDLZ), focused on snacks and candy. Kraft Foods was the second-largest position in the Bloomberg Spin index and the largest in the Guggenheim ETF, according to Spin-Off Research. Nevertheless, the ETF has underperformed the index mainly because it buys spun-off shares after six months of trading. Spinoff trading is more efficient now and often stocks of the parent begin to rise on a spinoff announcement. Waiting six months to buy the shares forces the ETF to pay up for them, according to Joe Cornell, publisher of Spin-Off Research. 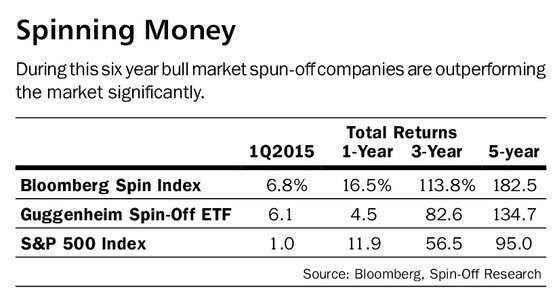 Spinoffs tend to do well when the market rallies but could flag in a downturn. If the market’s gyrations are making you dizzy, it might be time to take a different kind of stock for a spin. Spin-offs, corporate divestitures of units into brand new and independent companies, are spinning into gold for investors so far this year. These corporate maneuvers are turning into solid performers – both in the long-term and the short-term. It pays – big time – to pay attention to these spin-offs. Spin-offs are as popular than ever with activist investors pressuring companies to break off units into smaller and more nimble competitors. The recent run of spin-offs is hard to argue against. The Guggenheim Spin-Off exchange-traded fund (CSD), an investment that tracks the performance of spinoffs, delivered a 6.1% total return during the first quarter, says Joe Cornell of Spin-Off Research. That beats the 0.95% return of the Standard & Poor’s 500. Much of the success of spinoff stocks this year is due to Kraft (KRFT) – which shot up 40% after a group backed by famed investor Warren Buffett bought it. Due to its big market value relative to other recent spinoffs, Kraft holds a 6.4% weight in the Guggenheim ETF, Cornell says. Don’t make the mistake of writing off spin-offs as just a recent hot streak. The Guggenheim Spin-Off ETF’s total is up 134.7% over the past five years, topping the 95% total return of the S&P 500 during that time, Cornell says. The Bloomberg Spin Index is up even more, 182%, since it adds new spin offs immediately instead of waiting after six months of trading as the Guggenheim ETF does, Cornell says. Spin-offs are down from recent years. There were seven completed spin-offs in the first quarter of 2014 – and there have only been five completed this year so far, says Spin-Off Rsearch. But there’s definitely interest in the area. Activists see spin-offs as an ideal way to carve off a lucrative niche of a business and put it in the situation of needing to focus to maximize returns. And investors like what they see in terms of returns.